Jawbone, the wearable device company once valued at $3 billion, has ceased operations and begun liquidation proceedings, according to The Information. The company has been involved in a number of high-profile intellectual property disputes in recent years with Fitbit. Envision IP analyzed the patent portfolio of Jawbone’s parent company AliphCom (also known as Aliph) to determine the scope and potential value of its patents. AliphCom currently owns 251 United States patents. The vast majority of these, 176 patents, were obtained through AliphCom’s purchase of BodyMedia, Inc. in 2013 for over $100 million. Out of the remaining patents, approximately 50 patents were organically filed-for and obtained by AliphCom. The remainder of the portfolio was acquired from various third-parties including Radiient Technologies (speaker technology), Spectros Corporation (bio-sensing and cancer detection technology), University of Maryland (genetic marker technology) , and Sextant Medical Corporation (non-invasive tissue analysis technology). Regarding the types of patents, 126 are design patents covering various hardware, screen, and interface designs. Interestingly, we identified only 20 patents in the entire portfolio which have claims directed to software and business methods. The remaining 105 patents are directed towards hardware systems and devices. The average remaining term of the US portfolio is over 11 years, which provides plenty of time for a potential acquirer to monetize the portfolio, either through licensing, commercialization, and/or litigation. With respect to potential acquirers, the major wearable device and smartwatch manufacturers, Apple, Google, Samsung, LG, and of course FitBit may be natural candidates. In addition, Swatch, Nokia (Withings), Sony, Nike and Xiaomi could also find some synergies between their devices and the Jawbone patent portfolio. 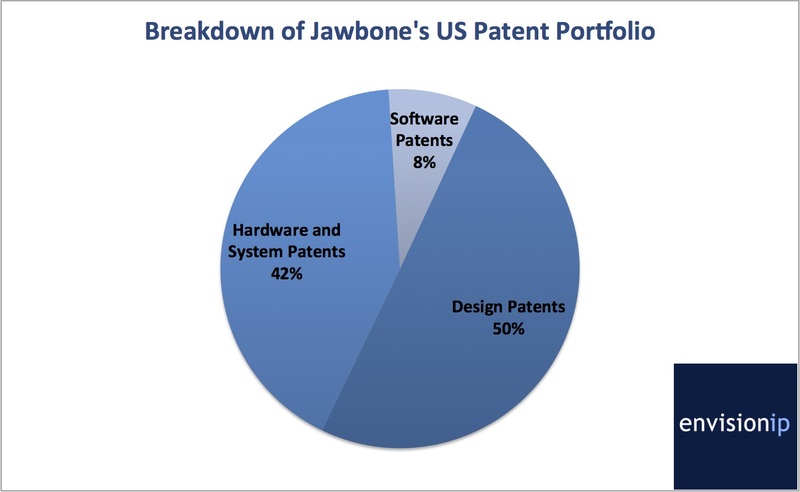 However, since nearly half of the portfolio is composed of design patents, it is likely that an operating company that obtains the patent portfolio would likely do so along with Jawbone’s product line, and rights to continue commercializing the technology in some fashion. We do not expect a non-practicing entity to be particularly interested in the portfolio, unless they feel that certain patents have significant litigation strength and value. To this point, we identified US 6,605,038 entitled “System for monitoring health, wellness and fitness”. The patent has almost 1,100 forward citations, and has been asserted by Aliphcom against Fitbit in the Northern District of California. The patent was acquired from Bodymedia, which itself had previously asserted the patent against Basis Science Inc. That case was dismissed pursuant a joint stipulation. In addition, US 7,020,508, entitled “Apparatus for detecting human physiological and contextual information” has over 700 forward citations. An impressive 10% of the portfolio (27 patents) have more than 100 forward citations, indicating that these patents may be relatively fundamental to the fitness/activity tracking and monitoring industry. The portfolio is relatively robust, and includes a significant number of patents related to speaker technology, microphone and audio calibration, various fitness and activity tracking features, and physiological monitoring. See for example, US 8,870,766 entitled “Apparatus for providing derived glucose information utilizing non-invasive physiological sensors”, US 8,663,106 entitled “Non-invasive temperature monitoring device”, and US 7,938,783 entitled “Medical body core thermometer”. In addition, the portfolio includes tissue imaging and genetic marker detection patents, which indicate that Jawbone may have been developing (or planning to develop) wearable devices with such advanced features – possibly for medical device and medical imaging verticals. Regarding a potential valuation of Jawbone’s patent portfolio, it is difficult to estimate an intrinsic valuation as there are no public financials directly related to the patents. However, based on historical commercial revenue, we estimate the portfolio alone to be roughly worth $25 to $40 million, based on a discounted cash flow analysis. We used a $600 million revenue run rate that was reported by TechCrunch in 2014 as a baseline. Understanding this data point is likely dated, we assumed that a potential acquirer who continued commercialization could potentially achieve 5% of this revenue ($30 mm per year) going forward. We assumed a significant discount based on the distressed nature of the company and liquidation of the assets, as well as a modest 4% compound annual growth rate that we estimate an acquirer may achieve. It is important to note that the price that a non-practicing entity may be willing to pay could be much lower however, given that such an acquisition would be based on licensing and litigation potential, and not necessarily the commercial potential of the patents.